THE CURVED MONITOR FOR IMMERSIVE GAMING The 32HC1QUR P model from AOpen is a vibrant, wide quad high-definition monitor that lets you play games smoothly with the latest cutting-edge gaming tech, with all your games being displayed on a beautiful 31.5" 1800R curved display, featuring a -5°~ 15° tilt so you can adjust your monitor however you like. It runs impressive 2560 x 1440 WQHD content at a 144Hz refresh rate, delivering to gamers incredibly defined visuals and ultra-smooth frame rates with a 4ms response time. This VA display features intuitive AMD® Radeon FreeSync™ technology that achieves silky, fast-action gameplay with ease, along with AOpen's Flickerless™ and BlueLightShield™ technologies that allows you to game as long as you like whilst protecting your eyes from damage and fatigue. 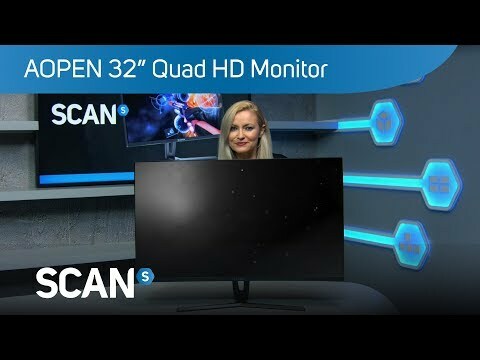 SUPER-SMOOTH GAMING WITH 4MS RESPONSE TIME Experience crisp, vivid imagery with AOpen's 32HC1QUR P, the monitor that provides gamers with intense wide quad high-definition visuals at 144Hz, and delivers extreme frame rendering at a rapid 4ms response time to give you gameplay without blurring. Enjoy your favourite game titles with unparalleled levels of detail, high-quality graphics and sharp text. SUPERIOR HIGH-DEFINITION VA PANEL The stunning AOpen 32HC1QUR P monitor hosts a VA display with vivid 8-Bit colour depth for up to 16.7 million colours on a wide-quad high-definition display that allows you to see more and truly immerse you into your gameplay. Games are sharper with more accurate colours and hidden features are more apparent with the WQHD display. CINEMATIC 1800R CURVED DISPLAY Whether you're watching movies, surfing the web, editing photos or playing intense games, the AOpen 32HC1QUR P allows you to experience more cinematic and immersive viewing with its sleek-looking 1800R curved screen. GAME SMOOTHLY WITHOUT ANY LAG AOpen's 32HC1QUR P lets you experience the smoothest and fastest gameplay you could imagine, with high-quality graphics for total gaming perfection. Play the games you love with crystal-clear clarity with integrated AMD® Radeon FreeSync™ technology which syncs your monitors frame rate to your graphics card to eliminate screen tearing and drastically reduce display stutter and input lag to deliver an ultra-smooth gaming experience.